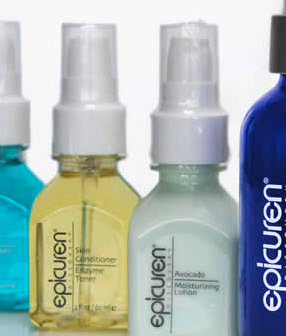 Epicuren Discovery is a skin care line from California. The technology of Epicuren is based on the Epicuren Enzyme protein complex called Metadermabolic enzyme as well. This enzyme is a protein derived from pharmaceutical enzyme research performed on burn victims. Researchers applied the research to healthy skin. The enzyme used by Epicuren encourages the skin to self-rejuvenate. The skin is more vibrant, and youthful after using the Epicuren regimen for a few weeks. SkinCareLab was the first place in New York to introduce this west coast skin care line and we incorporated it in our signature facial. Our estheticians find that the products can be customized to suit any skin type. The Epicuren Skin Care products range from cleansers, exfoliants, sunscreen, masks (that we use in our spa treatments), moisturizers, anti-aging creams and more. You can start your Epicuren Discovery in our Spa in New York or purchase Epicuren products at our online skin care product store.